Deposits should be made with the prior consent of co-authors. If you deposit a file produced by a publisher (publisher reprint, a file downloaded from the publisher’s website, or a digital copy of a printed original), make sure you are allowed to do so, either by asking for the publisher’s permission or by consulting websites listing their policies (Sherpa, Héloïse, Dulcinea). 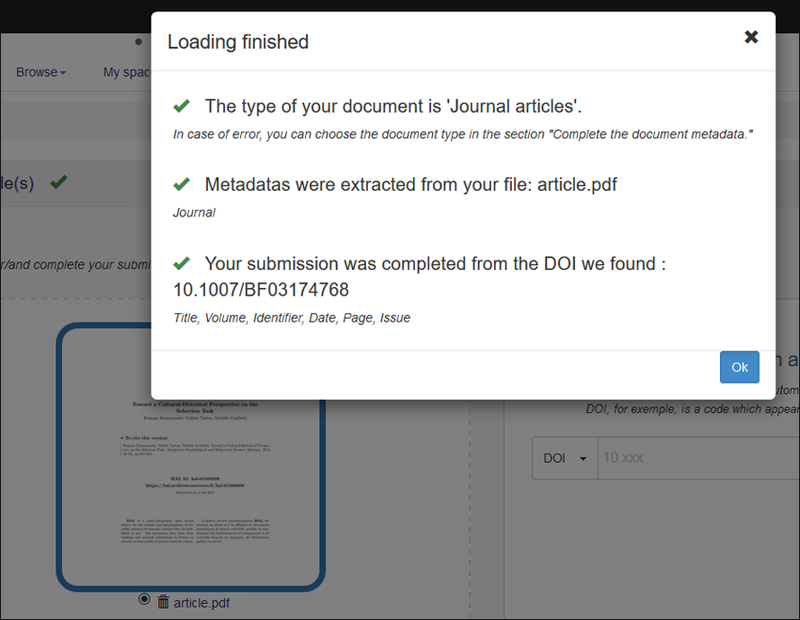 if the doi is mentioned in the pdf file or if you add it, HAL retrieves the metadata that is associated with the doi in the CrossRef database. if you have uploaded several files, the data must be extracted from the main file: select the main file to be extracted by clicking the button next to the file name. 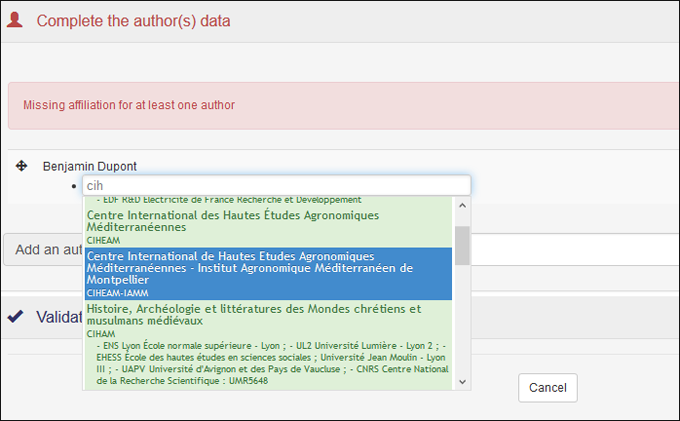 if no metadata is retrieved from the doi: either the identifier is incorrect, or the publisher has not or has not yet provided the metadata to CrossRef. The table below lists the required metadata for a deposit to be complete. If you want to add more information, click the detailed view in the “Complete the document’s metadata” section. Click on the indicated section(s) in red and then complete the missing informations. Preferably use a green or yellow item. yellow : closed. You can select the item if it matches the metadata. The item has been verified and updated in the reference material. I understand that HAL reserves the right to reclassify or reject all deposits. If you find errors in the citation, click on the heading of the “Complete Document Metadata” section to view the metadata and make your changes. Each section (file, document, author) has a detailed view that displays options or a complete list of metadata. You can thus complete your deposit (before it is put online or once it is online). You can choose the default detailed view by selecting it in your submission preferences available in your profile.